Item # 280180 Stash Points: 1,799 (?) This is the number of points you get in The Zumiez Stash for purchasing this item. Stash points are redeemable for exclusive rewards only available to Zumiez Stash members. To redeem your points check out the rewards catalog on thestash.zumiez.com. 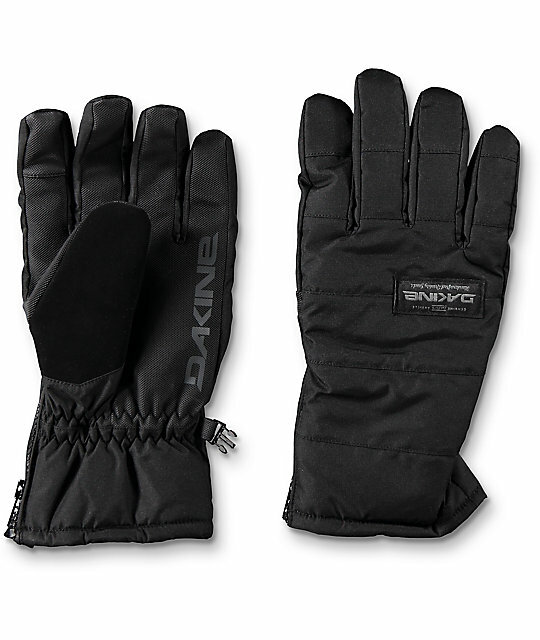 Dakine's Omega Snowboard Gloves feature a sleek design and an all-black colorway that'll go well with any outerwear kit. The exterior and palm materials are highly durable and treated with a DWR finish for superior moisture management. Completed with a warm low-profile insulation, and zipper cuff closure to enhance dexterity. Omega Black Snowboard Gloves from Dakine. Dakine 17/18 Men's Method Series.